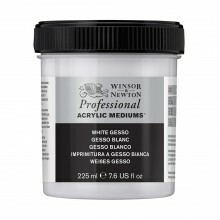 Acrylic gesso consists of chalk (or 'whiting') suspended in an acrylic polymer. It acts as a size, sealing the fibres of the substrate, while also giving an absorbent and textured ground suitable for oil or acrylic painting. It is best applied in several thin layers. The difference between acrylic gesso and acrylic primer is that acrylic gesso contains more chalk. It therefore produces a rougher, more absorbent surface than most acrylic primers, which some painters prefer. Available in 225 ml, 450 ml & 946 ml. Available in 500 ml, 1000 ml & 5000 ml.